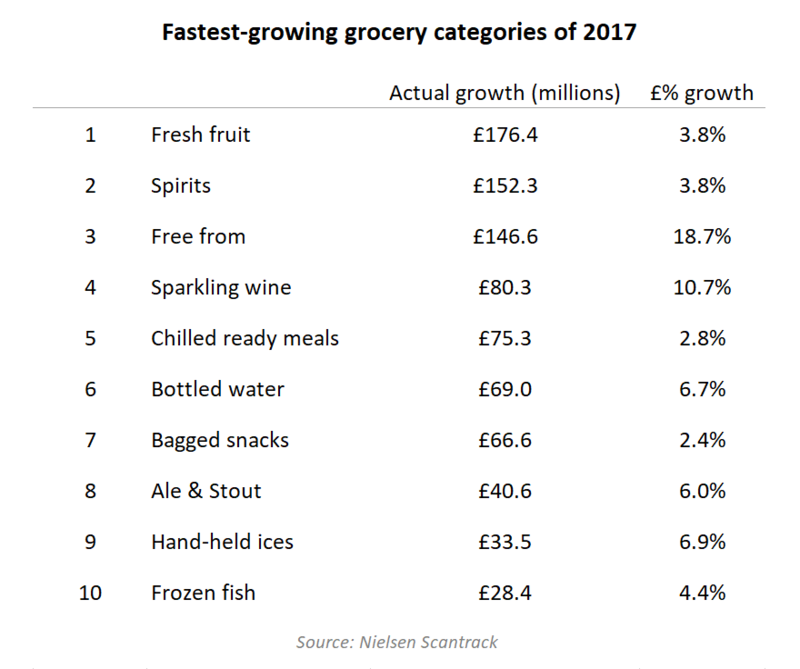 There’s a distinctly contrasting nature to the fastest-growing grocery products of the year as fresh fruit and ‘free-from’ led the way, alongside spirits and sparkling wine. Shoppers also splashed out an extra £80.3 million on sparkling wine, while bottled water and ale & stout – which became a bigger market than instant coffee – also featured in a contrasting top 10 in terms of healthy eating and drinking. “Supermarkets have done a good job at protecting shoppers from the brunt of rising costs, however, it’s still been an anxious year for households about their grocery bills,” says Ian Mansley, Nielsen’s head of grocery analytics. However, the fastest-growing product of the year was a more traditional brand – Budweiser, upon which shoppers splurged an extra £49.2 million this year, ahead of energy drink Monster (up £31.3 million) and avocados (up £29.8 million).